Earlier this week, I officially began teaching catechism classes to my parish's sixth graders. I have to say, I felt a little frazzled as this was the first time I've ever had a class to myself, but the first day, albeit short, went well. At my former parish, I was able to sit in on a few classes as an aide, but my work schedule at the time didn't allow me to continue. Now though, it seems that everything has fallen into place, and if it's God's will that I be a catechist to our young people, so be it. I've felt this pull to do so for a couple years now, as I've gone farther and farther on this journey of faith in Christ. I've felt more on fire than ever and I wish to proclaim the Good News to all who will listen; perhaps now I'm finally living up to the expectations I was given when I received the Sacrament of Confirmation. I think every practicing Catholic can see how disastrous religious education has been in recent decades. There are so many people who do not know their faith, and I've seen it first hand as almost no one from my class of around 25 students at my Catholic grade school are currently practicing Catholics, including some of my very good friends. It saddens me deeply, and I don't want the same thing to happen to our young people today. These young people are in so much need of our prayers and support. And because that need is so great, I keep finding myself wondering if I'm really qualified... if I can do this. I can only hope and pray to God that I am, and that I can plant some seeds in these young people's hearts. I did notice one great thing on our first day. I reminded the children to genuflect before our Lord present in the tabernacle upon entering church. Some didn't know what a genuflection was, or why we do it. Hopefully, I made that apparent in my explanation, and it seemed to hold as the children surprised me by genuflecting one by one, instead of at the same time, as they exited the pews. And it wasn't the fake "I-don't-have-time-for-this" bow... it was reverent and meaningful. An acknowledgement that our Lord, whom they just received, was also still present in the tabernacle behind the altar. I can only hope that the Holy Spirit grants me the grace to teach these children our faith well. So please, pray for me and the young people I am teaching this year, that we may both grow in holiness and grow to love Christ ever more deeply. 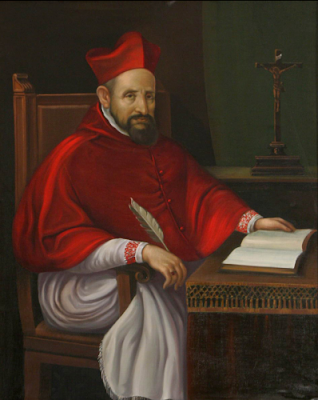 I just recently found out that two of my favorite saints, St. Charles Borromeo and St. Robert Bellarmine (whose feast day was just celebrated on Sept. 17th), are the patron saints of catechists. In addition to my patron saints, I know to whom I will be asking for intercessory prayers this year. St. Charles Borromeo and St. Robert Bellarmine, pray for us!